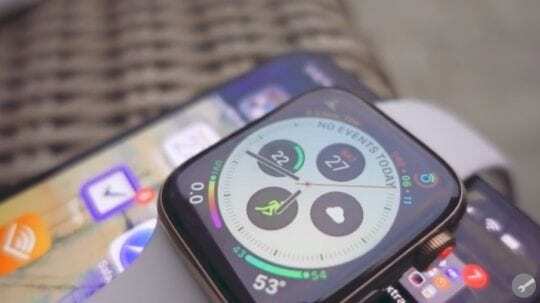 The Apple Watch Series features the first design change in the history of the wearable device. The latest model 4 features a speaker that’s 50 percent louder than previous models. Additionally, the microphone has been relocated to the opposite side of the device to reduce echoes for clearer phone calls. 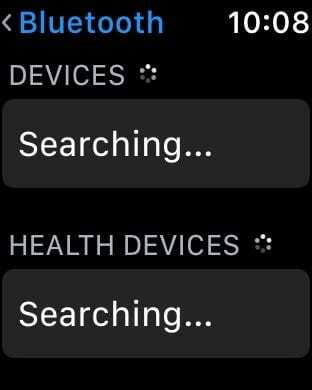 If you’re experiencing Apple Watch volume problems, try these solutions. Most of these are usable, regardless of the Apple Watch version you own. 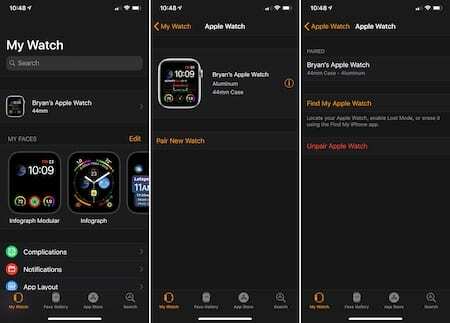 Just make you have watchOS 5 or later installed. 3.1 What’s the difference between Silent, Do Not Disturb, and Theater Mode? 9 Have You Been Around Water? 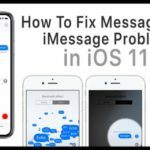 Apple Watch Walkie-Talkie Not Working? How To Fix It Today! Bands and charging docks aren’t the only accessories you can buy for your Apple Watch. There are also covers that have been designed to protect your investment better. Unfortunately, some of these products end up covering the Apple Watch’s speaker or microphone in the process of safeguarding your device. If you’re having sound issues with your watch, the first thing you should do is remove the cover and see if that was the problem. For many years, I worked as an IT professional in an office environment. When someone had a minor problem with their computer or another device, my first troubleshooting step was to reboot. 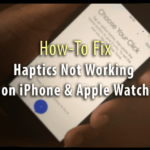 I offer the same recommendation if you’re having sound problems with your Apple Watch — especially if the issue has just popped up or is intermittent. Press and hold the side button on your device until you see the Power Off slider. Drag the Power Off slider, moving your finger left to right. After your watch turns off, be sure to press and hold the side button to restart your wearable device. Maybe there’s nothing wrong with the sound on your Apple Watch. Instead, perhaps the watch is set to Silent, Do Not Disturb, or Theater Mode. Changing it back is a simple process. What’s the difference between Silent, Do Not Disturb, and Theater Mode? When Silent Mode is turned on, your watch won’t make any noises. However, haptic notifications remain. A bell icon identifies it. 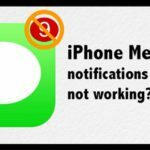 Do Not Disturb Mode keeps calls and alerts from making sounds or lighting up the screen. Look for a moon icon. Finally, Theater Mode activates Silent Mode. In the process, it also keeps your screen dark until you tap or press a button. A theater mask icon denotes the mode. Make sure your watch is showing a face. If it isn’t, press the Digital Crown until you see one. Next, swipe up to reveal the Settings Glance. Look for the icons mentioned above and tap the ones that were on. Better yet, turn them all off to troubleshoot. 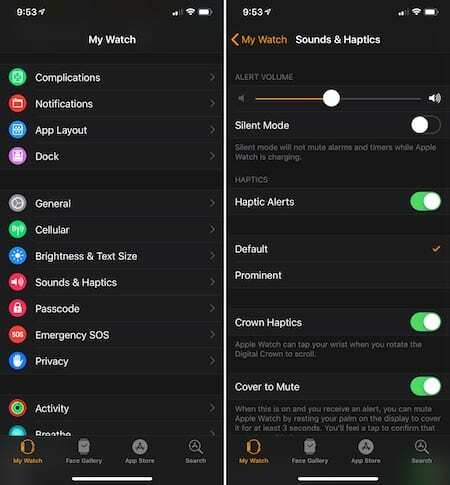 You can also turn Silent Mode on/off through the Apple Watch iPhone app. Select Sounds & Haptics under My Watch tab. Next, make sure set the Silent Mode toggle to the off position. Change it as needed. Do you have wireless headphones paired with the wearable device? 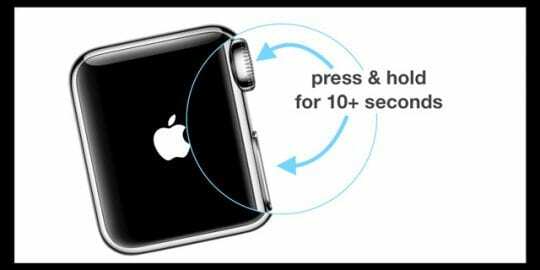 This accessory could be the reason behind your Apple Watch volume problems. Tap on the Digital Crown to find the Settings app. Select it. On the list of devices, make sure there isn’t a device attached. If there is, click on the “i” info button and tap Forget This Device. Better yet, you can also detach the accessory just by turning it off. 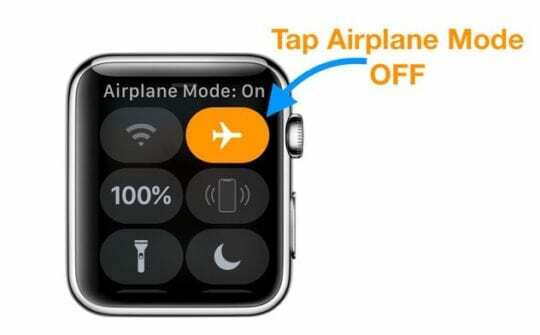 If your watch is still having sound issues, you may want to turn Airplane Mode on/off. 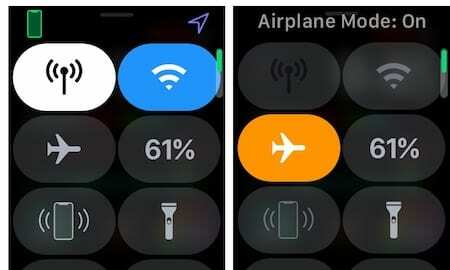 This setting is only available on an Apple Watch with cellular. Look for the Airplane Mode icon and turn it to the On position. The symbol includes an image of an airplane. Wait a minute and then turn Airplane Mode off. Try to make a call. 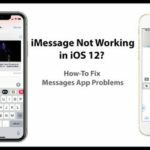 Is the problem resolved? 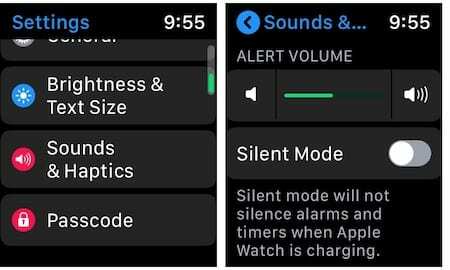 You can change the Alert Volume on Apple Watch on both the wearable device and on iPhone. For testing purposes, set the volume to the highest level, then test again to see if the issue remains. Open the Settings app on your wearable device. Tap Sound & Haptics and check/change the Alert Volume. 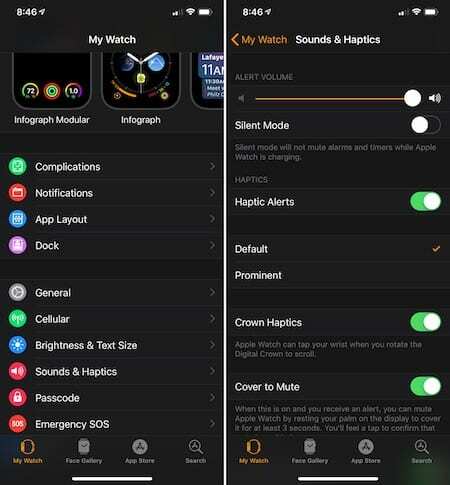 In the Apple Watch app on your iPhone, select Sounds & Haptics from the My Watch tab. During a call, you can also try adjusting the volume settings using your Digital crown. Check that you are not muting the call by accident. 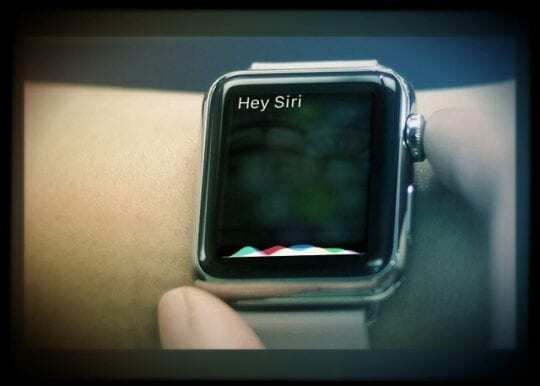 Some users have a hard time adjusting to the blaring volume of Siri on a new Apple Watch. 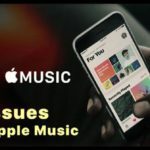 If you recently purchased a Series 4 Apple Watch, the default speaker volume is louder than the older Apple Watch versions. 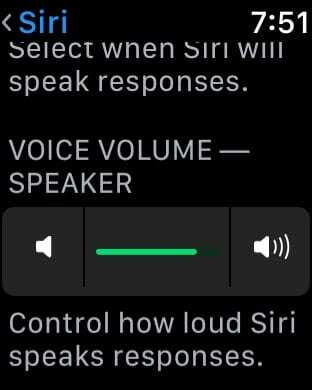 You can, however, personalize the Siri Volume on Your Apple Watch by using the Settings on Apple Watch ( Not the Watch iPhone App). To get started, Tap on Settings > General > Siri > Scroll down and adjust the speaker volume using the controls for Voice Volume Speaker. 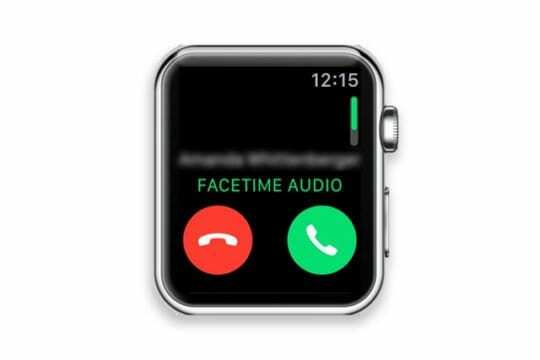 Are you have sound issues on your Apple Watch during regular calls and FaceTime? If you are, continue to troubleshoot. If the problem only happens during regular calls, there could be something wrong with your cellular connection. In this case, it could be a temporary issue. Have You Been Around Water? 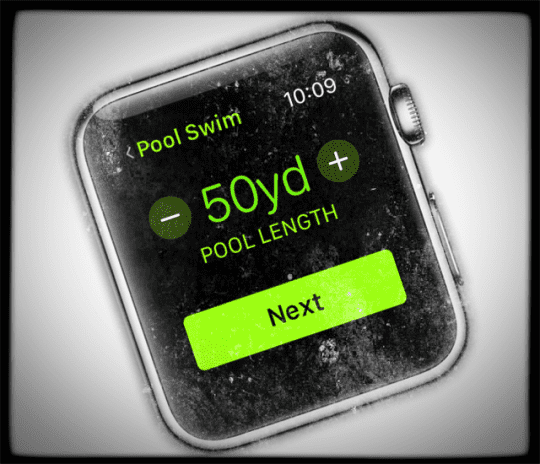 Current generation Apple Watches are water resistant, which makes them ideally suited for swimming. After doing so, however, you should unlock the watch and have the speaker eject whatever water might be stuck inside. 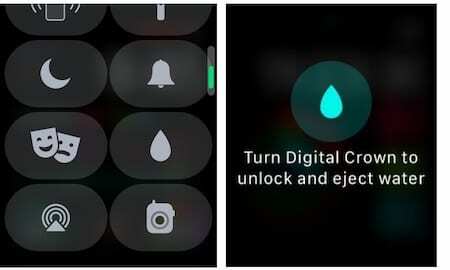 Look for the Water Lock setting, which is denoted by a water drop icon. Tap to turn the setting on (if it isn’t already). You’ll be automatically sent back to the Apple Watch face. From here, turn the Digital Crown to unlock and eject water. 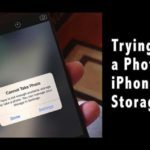 If you’re still experiencing Apple Watch volume problems, you might have to consider unpairing, then restoring your device from backup. Click the ‘i’ info button. Select Unpair Apple Watch and follow the instructions. The content on your Apple Watch is automatically backed up using iCloud alongside your iPhone. During the setup process, you can restore your Apple Watch from a backup. During the process, select the most recent backup version to restore. If you’re still experiencing sound issues on your Apple Watch, it might be best to get Apple support involved. You can schedule an appointment at a local Apple Store or send your wearable device in the mail for service. 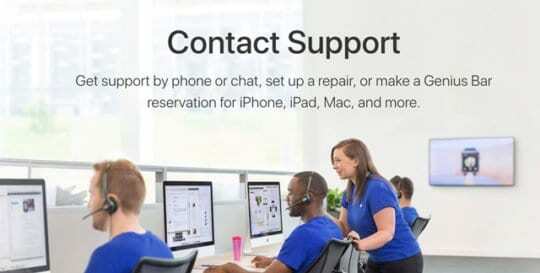 To get started, visit the Apple Support website. 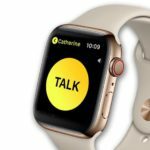 Thanks to hardware and software advancements, the Apple Watch is used much more often for sound-related tasks, such as making calls. 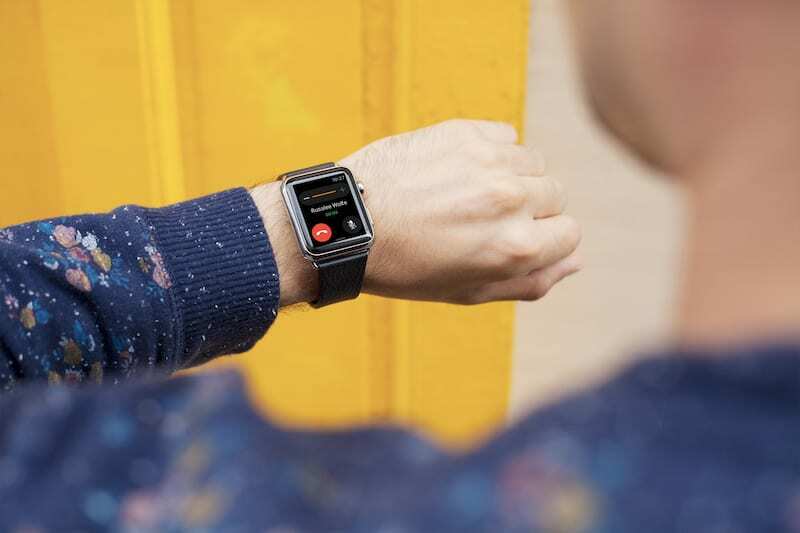 If the sound on your wearable device is muffled or the volume is too low when using these features, there are steps you can take to resolve the issue(s). Hopefully, you’ll find the solution right for your situation here. Let ones did you find most useful? 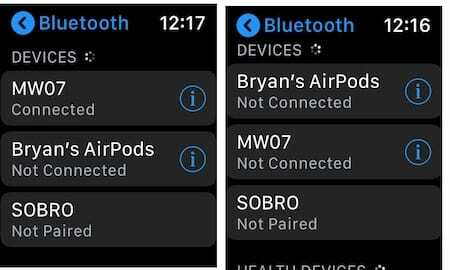 These tips work for all Apple Watch models that support watchOS 5–and yes, absolutely the Series 3 Apple Watch–both models, WIFI only and LTE-Supported.